Blog Quick Quotes: November Club Q with Louise! November Club Q with Louise! Louise here with a couple of scrapbook pages that I made using this month's Club Q kit. The November Club Q page kit features beautiful fall colors that can be used to scrap family gatherings or a variety of other fall events. November is the month to think about what we are thankful for. With teenagers, we are thankful for many different things: that they have nice friends, good activities that keep them out of trouble, and success in their endeavors. This first page is celebrating an athletic victory, and the journaling mentions both the team championship and the good friends my son has made through his team. 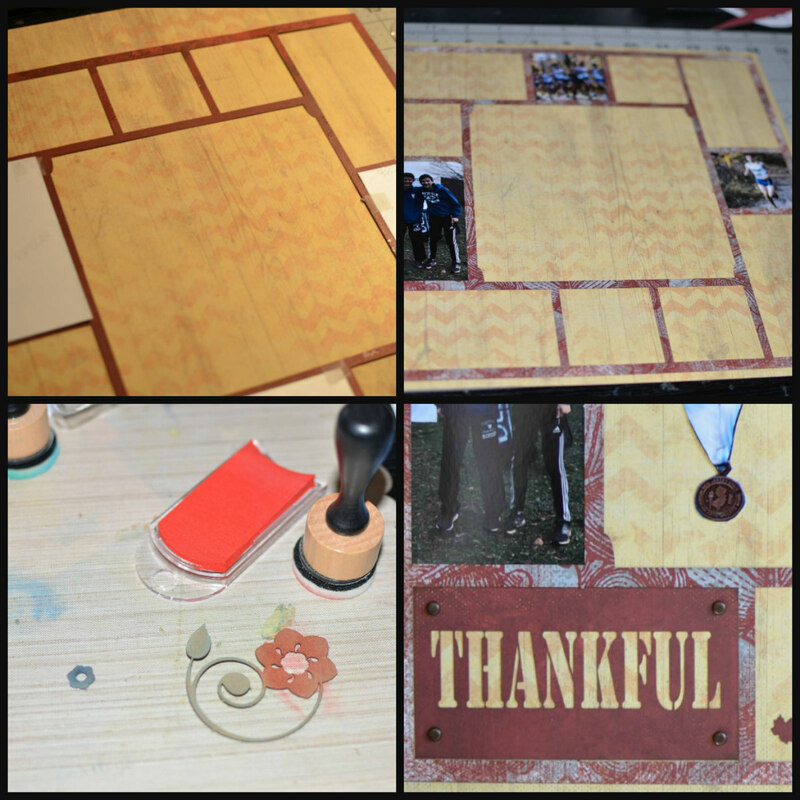 The pre-cut frame that came with my November Club Q made it very easy to create this grid layout. The small pictures were trimmed a little larger than their intended spaces and were adhered onto the back of the frame. Next the frame with the small photos attached was adhered onto the background paper. I added the reverse side of some of the cut-out rectangles into the spots where they fit. The chipboard flower was colored with PowderPuff Chalk Ink in Deep Sea, Lipstick, and Sea Foam using my ink blending tool. I took a photo of my son's medals and fussy cut them out to use on the page. I added some of the paper leaves that came with the kit and punched a couple more using a leaf punch. All edges are inked with Mahogany PowderPuff Chalk Ink. This next page is about my son getting his driver's license and that he was grateful that to have passed his driving test on the first try. All of the papers in these kits are double sided and I like to look at both sides of each paper before deciding which to use. I love the gray wood print and thought it would be perfect for the background. 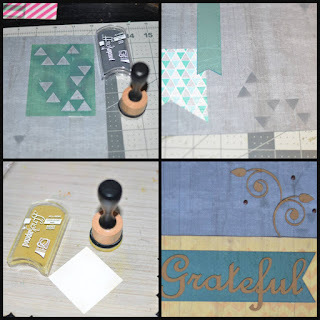 I used a stencil and Cool Gray PowderPuff Chalk Ink to add a subtle triangle pattern on the gray background to match the triangle pattern in the large pennant. I decided to add a little more subtle interest to the background by stamping the words "Happy Birthday" in a few places, again using Cool Gray. For my journaling, I cut a piece of white cardstock to fit in the chipboard frame. I didn't want the white to be too bright so I very lightly applied Sandy Shore PowderPuff Chalk Ink using my ink blending tool before journaling. I used the same technique for the white cardstock I used to mat my photo. 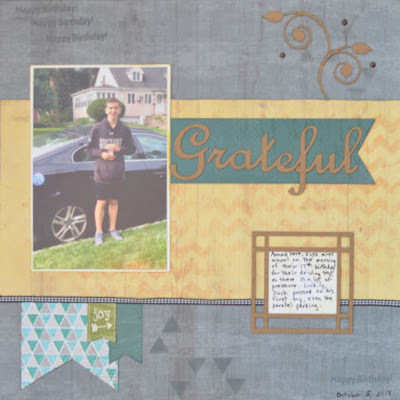 The chipboard title, flourish, and journaling frame were all part of my kit. I usually use my PowderPuff Chalk Inks to color or enhance my chipboard, but this time I really liked the look of the plain chipboard with the fall colors and masculine theme, so I left them as is. The edges of my photo mat are inked with Sandy Shore PowderPuff Chalk Ink. 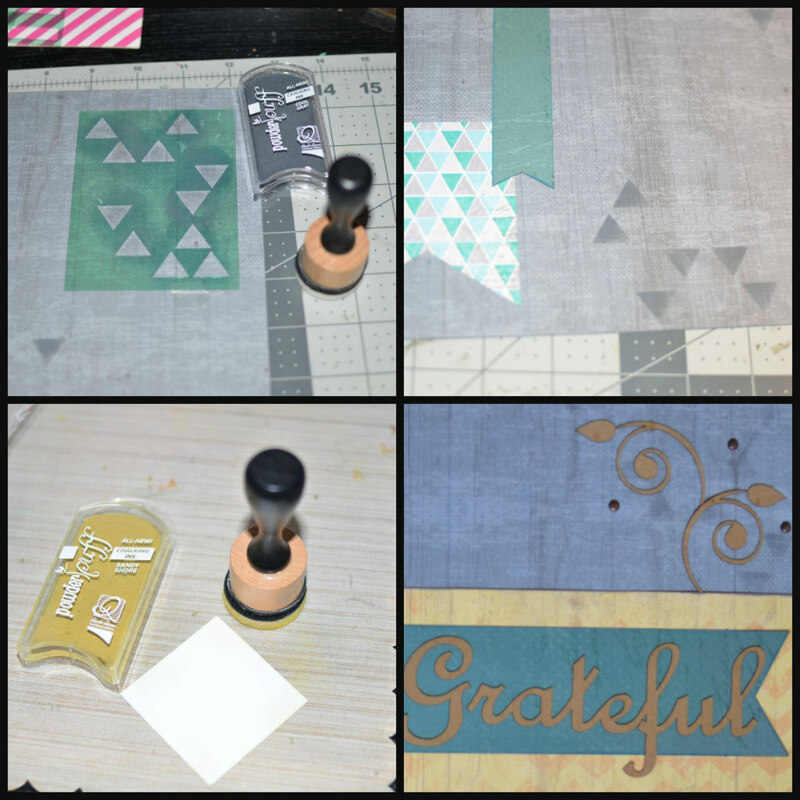 All of the patterned papers are edged in either Cool Gray or Capri Blue. The gingham ribbon and "joy" pennant were from the Altered Project part of my Club Q kit, but there is still enough left for those projects. I loved using the beautiful fall colors in this month's Club Q!